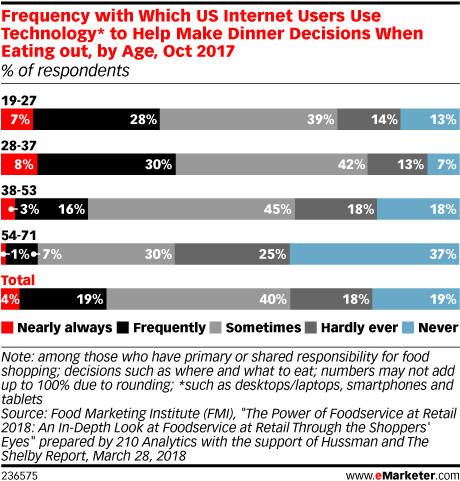 Data is from the March 2018 Food Marketing Institute (FMI) report titled "The Power of Foodservice at Retail 2018: An In-Depth Look at Foodservice at Retail Through the Shoppers' Eyes" prepared by 210 Analytics with the support of Hussman and The Shelby Report. 1,500 US internet users ages 18+ were surveyed online during September 22-October 4, 2017. All respondents had primary or shared responsibility for food shopping. Sample adjustments were made to ensure the sample accurately mirrored the population. The margin of error associated with the survey is +/-2.5 percentage points at the 95% confidence level.